The Prātimokṣa (Pāli, pātimokkha), presumably the oldest section of the Vinaya, contains the disciplinary code that regulates the life of the Saṅgha, the Buddhist monastic community. The etymology of the term prātimokṣa is uncertain, but it denotes the highest standard of conduct for Buddhist monastics. In the early days of the Buddhist community, the prātimokṣa was apparently a simple profession of faith in the Buddha’s primary teachings that was recited periodically by the expanding Saṅgha. Later, the term came to refer to the corpus of disciplinary rules that developed gradually over time as the Saṅgha grew and regulations were formulated in response to specific incidents of misconduct. The prātimokṣa is recited twice a month, on the full moon and new moon days, at an observance known as Saṅgha Poṣadha (Pāli, uposatha). This observance is a rite of confession in which the actual confession of faults precedes the recitation of precepts and declaration of purity. 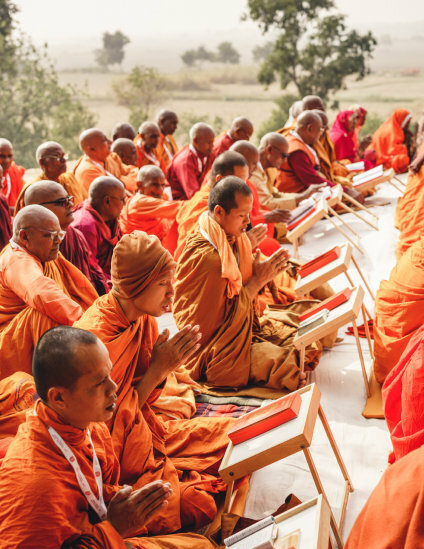 The Bhikṣu-prātimokṣa is recited by fully ordained monks and the Bhikṣuṇī prātimokṣa is recited by fully ordained nuns in separate observances; novices and laypeople are not permitted to attend. The semi-monthly obligatory recitation of the prātimokṣa is a means of reviewing the ethical guidelines and rules of etiquette that the monks and nuns voluntarily agree to observe, and a time for them to reaffirm their purity with regard to the prohibitions. This liturgical observance, conducted within a sīmā (ritually established boundary), is a way to ensure harmony within the Saṅgha and between the Saṅgha and the laity. Rituals of repentance and confession and specific procedures for expiating offenses are prescribed. The importance of the precepts is evident in the Buddha’s declaration that the prātimokṣa would guide the Saṅgha after he passed away. The prātimokṣa precepts found in the Vinaya (monastic discipline) regulate the lives of Buddhist monastics who have received the upasaṁpadā (full Ordination), as well as novices and probationers who are in training. The precepts give detailed instructions that regulate ethical decision making, food, clothing, shelter, furnishings, and other material requisites, as well as the rules that govern etiquette and personal interactions. (5) śaikṣā (faults or misdeeds, such as wearing the robes improperly or eating in a careless fashion). There is 1 additional category for Bhikṣus, the 2 aniyatadharma (individually confessed downfalls), and 1 for Bhikṣuṇīs, the 8 pratideśanīya (offenses requiring confession). These 7 methods include: assembling the parties to the dispute, remembering events, admitting one’s responsibility, resolving matters by a majority decision, and so forth. but the prātimokṣa rules and procedures of all these schools are thought to derive from the rules of discipline that were originally recited at the first of the Buddhist councils. (3) as the Buddhist community spread to different geographical and cultural areas, some precepts were adjusted in accordance with local customs. These schools are in almost complete agreement concerning the precepts, exhibiting only minor differences. although the Bhikṣuṇī-prātimokṣa exists in Pāli, there is no living lineage of Bhikṣuṇīs in the Theravada tradition. 2) The Dharmaguptaka-Vinaya is preserved in Chinese and practiced by Bhikṣus and Bhikṣuṇīs in China, Japan, Korea, Taiwan, and Vietnam. although the Bhikṣuṇī-prātimokṣa exists in Tibetan, there is no living lineage of Bhikṣuṇīs in the Tibetan tradition. in the Mūla-Sarvāstivāda, there are 258 for Bhikṣus and 354 for Bhikṣuṇīs. The Bhikṣuṇī-prātimokṣa-sūtra exists in all 3 of these Vinaya schools, but a living lineage of Bhikṣuṇīs exists only in the Dharmagupta School. Tens of thousands of Bhikṣuṇīs in China, Korea, Taiwan, and Vietnam today regulate their lives by the Bhikṣuṇī-prātimokṣa of the Dharmagupta School. so the Bhikṣuṇīs were naturally expected to follow the majority of the Bhikṣus precepts, in addition to new precepts occasioned by specific misbehaviour among the nuns. (4) telling lies, especially about one’s spiritual attainments. (8) obeying a Bhikṣu who has been expelled from the Saṅgha. Bhikṣuṇīs in the Mūla-Sarvāstivāda have 20. Some saṅghāvaśeṣas are similar for Bhikṣus and Bhikṣuṇīs (e.g., acting as a go-between, baselessly accusing someone of a pārājika, refusing to accept admonishments, creating a schism in the Saṅgha), while others are dissimilar. 8. Upavāsatha (one-day lay observance). There is no counterpart to the siksamana (probationary nun) ordination for monks. The 1-7 categories of prātimokṣa precepts generally entail a lifetime commitment, except in countries such as Thailand where temporary ordination is offered. The 8th type of prātimokṣa precepts, upavāsatha, is the observance of 8 precepts for 24 hours by laypeople. The aim of all types of Prātimokṣa precepts is to cultivate restraint of the senses as a means to achieve liberation.